On deck for this Hack Chat will be [Jonathan Hirschman], the brains behind PCB:NG, a turnkey electronics manufacturing startup based around NYC. Jonathan is a self-taught hardware guy, proficient in PCB layout, 3D CAD, and manufacturing tech. PCB:NG is, essentially, taking oldskool manufacturing and making it into more of a digital process. PCB:NG makes it easy for anyone to get their designs manufactured, and to do it in the most cost-effective manner. What is this Hack Chat going to be about? We’re going to talk about how to get started in PCB creation. What is the the best tool for the job? What is the best tool that doesn’t cost as much as a car? What are the pros and cons of each tool, and what should you know about RF before designing a board that blinks a LED? This isn’t a Hack Chat that’s just about PCBs, though. We’re also going to be talking about manufacturing. Specifically, design for manufacturing, how to panelize boards, what happens when you forget fiducials, how to keep your designs cheap to manufacture, what happens when you put SMD components on both sides of a board. We’re taking questions from everyone, so feel free to add something to the question sheet for the discussion. We’re Looking For Hack Chat Hosts! 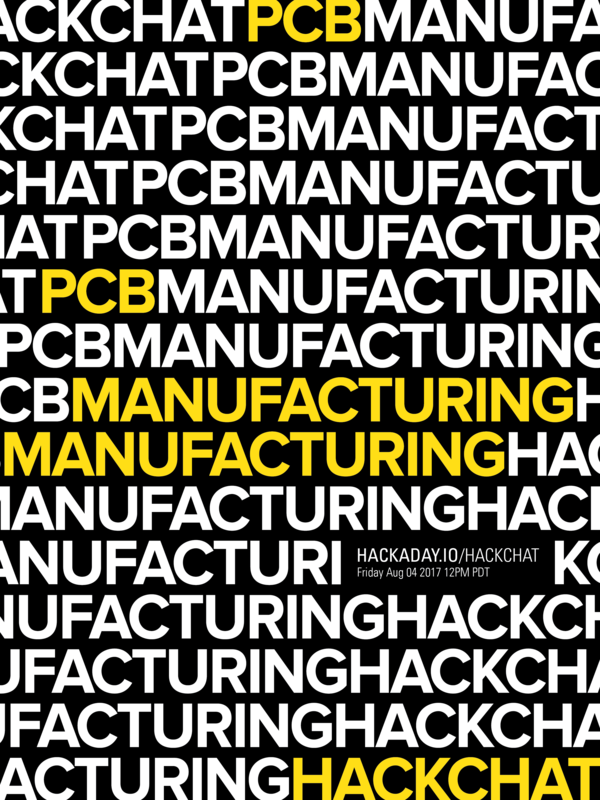 If PCB manufacturing and design isn’t your thing — or even if it is — we’re on the lookout for Hack Chat hosts. If you have some expertise in an area, give us a ring. We’ve already had a few chats with Raspberry Pi engineers, one of the brilliant people behind the ESP32, a talk on ASIC design for mixed signal oscilloscopes, and high-end audio amplifiers. We’re taking all callers, and if you have something you’d like to share with the community, send us an email. I would like to mention that it’s Burner season, and a few chats with the artists on the playa would be great, especially if they can tell us how to move the fuselage of a 747 a few hundred miles. Our Hack Chats are live community events on the Hackaday.io Hack Chat group messaging. This Hack Chat will take place at noon Pacific time on Friday, August 4th. Confused about where and when ‘noon’ is? Here’s a time and date converter! ← Eclipse 2017: Where Will You Be When the Sun Goes Away? Nah. Dead-end until some great homebrew pcb tech is developed. I been on every new technique since the 70’s and there’s nothing of serious note yet. DATAK was the closest.